Wine, walnuts and a warm welcome await people visiting the tasting room at the vineyard. Opening regularly for the first time this summer has meant that over 800 people from New Zealand and around the world have been able to enjoy wine tasting under the shade of two old walnut trees. After a rapturous greeting from Lucy (Graeme and Gillian's dog and our 'face' on Facebook) visitors have the opportunity to sample our range of wines whilst relaxing and enjoying the Central Otago sunshine in this magical place. No small wonder one of our wines is called 'Paradise'! 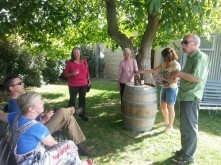 Photo courtesy of Jim Ashe: Pinot Thyme wine tours.